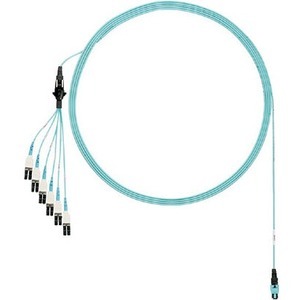 PanMPO™ Round Harness Cable Assemblies are pre-terminated 12-fiber cable assemblies. The unique design of the PanMPO™ Connector allows for rapid gender change in the field, in support of standards-compliant cable plant migration from 10G cassette-based systems to 40G MPO connector-based parallel optics cable plant. PanMPO™ Harness Assemblies meet the demands of 10G Ethernet, higher speed 40G Ethernet, and high-speed ANSI Fibre Channel systems, while maintaining compliance to the recommendations of TIA-568-C for both Serial Duplex and Parallel Optics wiring schemes. LC uniboot connectors reduce cable density on the switch by 40% and allow easy change of polarity.